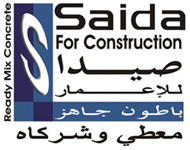 Saida for Construction (SFR) was established in 2008 to provide high quality in the production, sales and delivery of ready-mix concrete. Located in the industrial zone on a plot 10,000m2 . SFR utilizes a state-of-the-art dispatch and delivery system. With its self-owned computerized batching plant SFR has a capacity of production output exceeding 200m3/h of ready mix concrete , making it one of the largest producers in south dedicated exclusively to ready mix concrete with a staff resources, including drivers , plant personnel, technicians, sales representatives , engineers and corporate support staff , total over forty. SFR is dedicated to provide customer's specific concrete requirements , and its products are marked with the highest industry standards of product quality materials , services and reliability to insure maximum performance. Moreover, SFR is specialized in the supply of ready mix concrete to high rise buildings. SFR is equipped with four mobile CIFA concrete pumps on Mercedes/Astra trucks, a fleet of 20 transit mixer trucks , capacity ranging from 6 to 12 m3 and a fully equipped laboratory to carry out all necessary tests for concrete production. Quality assurance is an essential part of all the activities of SFR. By issuing a quality manual , the management of SFR announces its point of view and the way in which it controls quality , particularly with respect to management responsibility. SFR is committed to ensure that its quality system is fully and completely understood by its employees and everyone working for SFR, and the procedures of this quality system are implemented and maintained at all times. The quality system as documented in this quality manual is in accordance with the requirements of ISO 9001:2000. The quality system is periodically and systematically reviewed by means of both internal and external audits.